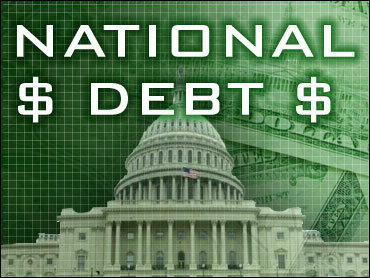 If you could buy stock in the National Debt, do it. It's headed for the moon. New projections contained in the Administration's Mid-Session Budget Review, show the National Debt doubling between now and the year 2020 when it's forecast to hit over $26 trillion. The new budget numbers show the Debt will top 100 percent of the nation's Gross Domestic Product, the total output of goods and services, in the year 2012. It'll stay above 100 percent for the remainder of the decade. The Debt goes up because of compounding by the annual deficits. The Budget Office projects the deficit in this fiscal year will total $1.47 trillion, enormous but not as large as first forecast in February. It'll be $1.4 trillion next year as well, according to the Review. A sharp decline in the annual deficit is forecast for 2012 when it will sink below the trillion dollar mark for the first time in four years to $911 billion. The deficit will remain in the $700 billion to $800 billion range for rest of the decade and hit $900 billion in 2020. But most troubling to Administration officials are the unemployment numbers. The new estimates forecast a slow-as-molasses decline in the national jobless rate over the next several years. Unemployment will average 9.7 percent of the workforce this year, 9 percent next year and 8.1 percent the year after that. It won't fall under 6 percent until the year 2015 when it's projected to average 5.7 percent. Outgoing Budget Director Peter Orszag says weak economic growth and "persistent unemployment" represent "the most pressing danger" the nation's economy faces. The GDP numbers remain in positive territory but they are slow to rise. The Review estimates economic growth will average 3.2 percent this year, 3.6 percent next and 4.2 percent in the two years after that. If nothing else, says Orszag, the numbers are a vast improvement over the negative growth in late 2008 and early 2009 - when he says the economy moved toward outright collapse. If you're a saver hoping that interest rates might start to climb, they will, but not by much. The Review forecasts that 91 day Treasury Bills will pay off at 0.2 percent this year, 0.7 percent next and 1.9 percent in 2012. Savers with money in bank accounts have been receiving barely a penny or two on each dollar in their savings accounts for the last couple of years because the Federal Reserve has been keeping the interest rates low in the hope banks will lend money to stimulate the private sector and create jobs. It hasn't worked out as well as the Administration had hoped.